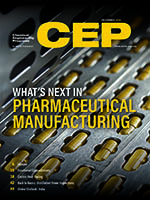 Read about current drug development trends and their impact on pharmaceutical manufacturing and how the industry’s manufacturing leaders are creating modular processing environments and applying continuous-flow technologies and single-use systems to meet quality, efficiency, and flexibility objectives. Other topics in this issue include functional contradictions, electric heat tracing, distillation tower inspections and India's expanding chemical industry. Process intensifications are a critical part of process development in the chemical process industries (CPI). In addition to traditional approaches, identifying and resolving contradictions can bring about new and valuable process improvements. Determine why your electric heat tracing system is not satisfying your process heating demands. Process engineers are responsible for inspecting distillation columns. Follow this guide to prepare for a column revamp and other inspections. The chemical industry is the backbone of India’s industrial and agricultural development. Achieving the industry’s ambitious growth targets will require a combination of policy intervention, company-level initiatives, industry-academic partnerships, wise investments, and greater international access.